April 30, 2018 – Discovery Metals Corp. (TSX-V: DSV) (“Discovery” or the “Company”) is pleased to announce the first batch of assays results from the detailed continuous underground channel sampling program at its flagship Puerto Rico project (“Puerto Rico” or “the Project”) in northern Coahuila State, Mexico. Results of the first 100 samples are presented in this release and are from the Zaragoza mine, one of three key historic mines on the Project. Results from the San Jose mine and Puerto Rico mine will be presented as results are received. Advance Gold Corp. (TSXV: AAX) (“Advance Gold” or “the Company”) is pleased to announce it has engaged Nicosia Capital (“Nicosia”), a Vancouver based investor relations firm specializing in resource companies. Nicosia will assist Advance in creating and implementing communication strategies that will facilitate relationships with finance professionals, investors and media contacts. Toronto, Ontario – (April 30, 2018) Argonaut Gold Inc. (TSX: AR) (the “Company”, “Argonaut Gold” or “Argonaut”) is pleased to announce its financial and operating results for the first quarter ended March 31, 2018. The Company reports a quarterly net cash1 increase of $7.2 million, cash flow from operating activities before changes in operating working capital of $21.0 million, net income of $12.2 million or earnings per share of $0.07, adjusted net income1 of $7.9 million or adjusted earnings per share1 of $0.04 and production of 40,853 gold equivalent ounces 2 (“GEO” or “GEOs”). All dollar amounts are expressed in United States dollars, unless otherwise specified (C$ refers to Canadian dollars). GOLDEN, Colo., April 30, 2018 (GLOBE NEWSWIRE) — Golden Minerals Company (“Golden Minerals”, “Golden” or “the Company”) (NYSE American:AUMN) (TSX:AUMN) has released final results from the 22-hole 4800-meter drilling program conducted at its Santa Maria property located in Santa Barbara, Chihuahua State, Mexico since August 2017. 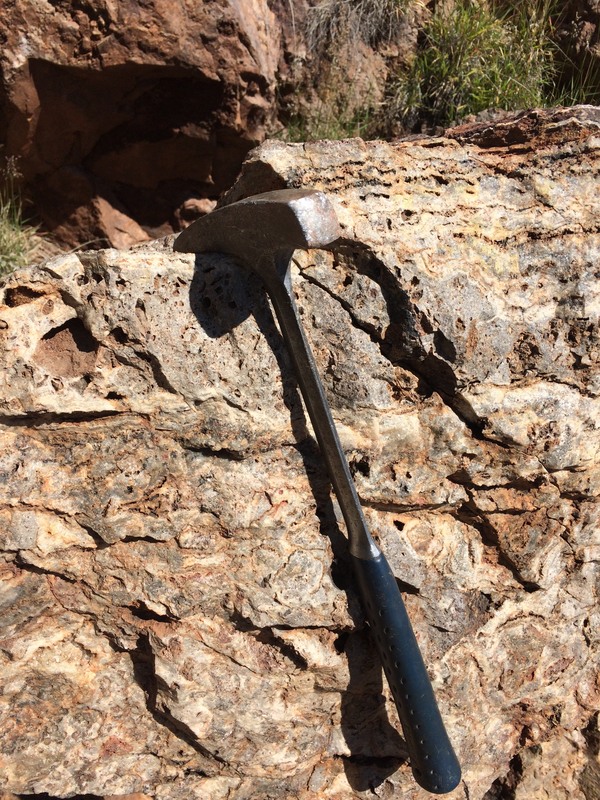 On the picture above, a banded quartz-barite vein in a prospect in Chihuahua state, Mexico. Photo by Miguel A Heredia. During the 17th week of the year (April 23th to April 29th, 2018), at least 19 press releases were announced by companies working in Mexico, with seven informing on exploration results, six reporting Q1 2018 results, two announcing financing, three communicating deals and corporate issues, and two reporting on resources & development. ON MEXICO ISSUES, Argonaut has taken legal measures to re-activate its explosive permit at its la Colorada mine in Sonora. ON EXPLORATION, In Sonora, Aztec Minerals & Kootenay presented drilling results from its Cervantes property and Azure reported recoveries and concentrate grades at its Oposura project. In Sinaloa, Goldplay received drill permit for its El Habal project. In Chihuahua, Mammoth announced drilling results from its Tenoriba project. In Zacatecas, Goldcorp presented drilling results from the Santa Rosa target near its Peñasquito Mine, and signed a LOI with Frisco to explore key regional targets at the Mazapil Valley. Prospero provided its plan work for the remainder of 2018 for its exploration projects in Mexico. ON MINING, Agnico Eagle reported Q1 results on its La India mine in Sonora, and Pinos Altos y Mascota mines in Chihuahua. Goldcorp reported Q1 results from its Peñasquito mine in Zacatecas. Capstone announced Q1 results from its Cozamine mine in Zacatecas. New Gold presented Q1 results from its San Pedro mine in San Luis Potosi. ON FINANCING, Oroco closed a private placement for $900K. First Mexican entered into an arrangement to secure a credit facility loan for up to $10M. ON RESOURCES AND DEVELOPMENT, In Sonora, SilverCrest filed a mineral resource estimate on its Las Chispas project. In Chihuahua, Agnico reported development progress and expansion drilling results on their satellite deposits within its Pinos Altos and Creston mines, as well as at its La India mine in Sonora. ON DEALS AND CORPORATE ISSUES, Bacanora Lithium announced director changes and the grant of options (Sonora Lithium project, Sonora). Capstone reported voting results from its annual general meeting (Cozamine mine, Zacatecas). Westminster announced VP appointment (El Cobre, Sonora). Argonaut Gold Inc., reported that the court has rescheduled the hearing pertaining the explosives permit from its la Colorada mine in Sonora to May 16, 2018. The company estimates it has sufficient ore to continue operations until the end of July, however, is taking legal measures to re-activate its explosive permit and re-commence blasting activities as soon as possible. Aztec Minerals Corp. & Kootenay Silver Inc., reported drilling results from the California target at the center of a gold geochemical anomaly within its Cervantes property. The most significant results are 160m of 0.77 g/t Au, 0.13% Cu, and 3.4 g/t Ag, including 80m of 1.0 g/t Au, 0.11% Cu and 4 g/t Ag. Azure Minerals Limited, reported flotation test results showing significant improvements of recoveries and concentrate grades at its Oposura project. Zinc and lead recoveries of 85.6% and 84% achieve concentrate grades of 57.2% and 61.4% respectively. Silver recovery in the lead concentrate is 67.1% at a concentrate grade of 323.8 g/t Ag. The positive metallurgy has reduced significantly the processing and marketing risk and has enhanced the project potential. Goldplay Exploration Ltd., received a drill permit to carry out a 4,000m drilling program at its El Habal project in Rosario, Sinaloa. The goal of the drilling program is to test low sulphidation epithermal mineralization targets generated by mapping and sampling of shallow underground workings along with a CSMAT geophysical survey. Mammoth Resources Corp., announced drilling results from the Los Carneritos target within its Tenoriba project in Chihuahua. Significant results are 126.8m of 0.47 g/t Au and 7.2 g/t Ag, including 58.2m of 0.73 g/t Au and 4 g/t Ag or 25m of 1.1 g/t Au and 2.7 g/t Ag; and 14.9m of 0.58 g/t Au and 3 g/t Ag. “These diamond drill holes at Los Carneritos extend the strike length of gold mineralization on the property a total of almost four km within a High Sulphidation system with mineralization open at least one km both to the east and west of this four km trend where gold has been sampled on surface”. Goldcorp Inc., presented initial drilling results from the Santa Rosa target near its Peñasquito Mine in Zacatecas. Significant intersections are 164m of 1.06 g/t Au, in disseminated, intrusive-hosted mineralization within dacite porphyry dykes, along with a 22m of 3.46 g/t Au interception of skarn mineralization. “The Santa Rosa system is interpreted as a quartz porphyry complex intruding a contemporaneous volcanic pile underlain by Lower Jurassic to Upper Cretaceous carbonate stratigraphy”. Goldcorp also signed a LOI with Minera Frisco to explore, under a JV agreement, key regional targets in the Mazapil Valley near Peñasquito Mine. Prospero Silver Corp. & Fortuna Silver Inc., provided a plan work for the remainder of 2018 on their different JV exploration projects in Mexico. In Chihuahua, they planned to drill the Bermudez and Trias projects with a program of 1,200m each. In Durango, a 3,450m drilling program will be conducted at their Buenavista project. In Hidalgo, they plan to drill a fourth hole by the end of the year at their Pachuca SE project. All the projects are low sulphidation epithermal style targets, with Buenavista in Durango displaying some characteristics of intermediate sulphidation affinity, like elevated base metals levels at depth in the system. Agnico Eagle Mines Limited., reported results on their Mexican operations. The company processed 1.7M tonnes from its La India mine in Sonora with a grade of 0.74 g/t Au to produce 23K Oz Au at cash cost of $700 USD per Oz Au produced. In Chihuahua, Agnico processed 519 K tonnes and 475K tonnes from their Pinos Altos and Creston mines respectively, with grades of 2.62 g/t Au and 0.67 g/t Au to produce 41.8K Oz Au and 12K Oz Au correspondingly. Total cash cost per Oz Au produced are $758 USD and $865 USD in that order. At Pinos Altos, production is transitioning from open pit to underground mining with a higher cost associated. Goldcorp Inc., reported results from its Peñasquito mine in Zacatecas. On Q1 2018, Goldcorp milled 8.96M tonnes with grades of 0.54 g/t Au, 23.5 g/t Ag, 0.19%Pb and 0.64% Zn to produce 98K Oz Au, 5.2M Oz Ag, 27M Lb Pb and 88.7M Lb Zn, at cash cost of $708 USD per Oz Au produced. Capstone Mining Corp., announced results from its Cozamine mine in Zacatecas. On Q1 2018, Capstone produced 4,285 tonnes of Cu at cash cost of $0.71 USD per Lb Cu produced. New Gold Inc., presented results from its San Pedro mine in San Luis Potosi. On Q1, New Gold produced 4.5K Oz Au and 0.1 M Oz Ag from residual leaching. Cerro San Pedro finished active mining in Q2 2016. Oroco Resource Corp., closed a non-brokered private placement for $900K. Net proceeds will be used for exploration expenditures (Santo Tomas, Sinaloa). First Mexican Gold Corp., entered into an arrangement to secure a credit facility loan for up to $10M. The funds will be used to bring into production the Karen Zone within its Guadalupe project in Sonora. SilverCrest Metals Inc., filed the mineral resource estimate on its Las Chispas project in Sonora. The Inferred resource estimate encompasses 3.44M tonnes of 3.63 g/t Au and 296 g/t Ag for a total of 401.6K Oz Au and 32.7M Oz Ag contained. Agnico Eagle Mines Limited, announced that the Sinter and Cubiro satellite deposits within its Pinos Altos mine are currently being developed to be mined from underground and a small open pit the first, and from underground the second. Both are expected to commence production in Q4 2018 and Q1 2019 respectively. It also conducted 3,450m of infill drilling on Q1 2018 at its Reyna de Plata deposit to convert inferred resources to indicated mineral resources. Significant results are 22.9m of 2 g/t Au and 53 g/t Ag; 17.7m of 0.9 g/t Au and 12 g/t Ag; and one hole with 9.6m of 1.7 g/t Au and 27 g/t Ag, and 3.6m of 4.2 g/t Au and 144 h/t Ag. At Reyna de Plata, mineralization style is low sulphidation epithermal veins hosting inferred mineral resources of 110 K Oz Au and 3.9M Oz Ag in 5.8M tonnes of 0.59 g/t Au and 21 g/t Ag at open pit depth, as well as 93K Oz Au and 1.4M Oz Ag from 1.2M tonnes of 2.35 g/t Au and 35 g/t Ag at underground depth. At the Madrono Zone, Agnico drilled 5,073m of infill and exploration drilling in 24 holes, within its Creston mine. Significant results are 16.2m of 2.2 g/t Au and 47 g/t Ag, 6.7m of 3.1 g/t Au and 38 g/t Ag, 7.5m of 2.2 g/t Au and 28 g/t Ag, and 7.8m of 1.4 g/t Au and 27 g/t Ag. Madrono hosts underground indicated mineral resources of 56K Oz Au and 863K Oz Ag hosted in 858K tonnes of 2.03 g/t Au and 31.3 g/t Ag, and inferred mineral resources of 144K Oz Au and 2.6M Oz Ag in 1.94M tonnes of 2.31 g/t Au and 41 g/t Ag. In Sonora, Agnico is conducting drilling programs focused on extending near pit mineralization at its La India mine as well as on other near-mine targets. On Q1 2018, the company drilled 6,833 m in 49 holes distributed at El Realito and Chipriona targets. Significant results are 58.5m of 0.6 g/t Au and 21 g/t Ag; 14.1m of 2.4 g/t Au and 3 g/t Ag, including 3.2m of 6.8 g/t Au and 5 g/t Ag; 18m of 0.6 g/t Au and 216 g/t Ag; and 56.3m of 0.9 g/t Au and 34 g/t Ag, including 28.9m of 1.4 g/t Au and 40 g/t Ag. Bacanora Lithium plc., announced director changes and grant options (Sonora Lithium project, Sonora). Capstone Mining Corp., reported voting results from its 2018 annual general meeting (Cozamine mine, Zacatecas). Westminster Resources Ltd., announced VP appointment (El Cobre, Sonora). Toronto, Ontario – (April 27, 2018) Argonaut Gold Inc. (TSX: AR) (the “Company”, “Argonaut Gold” or “Argonaut”) reports that the court hasrescheduled the hearing pertaining to Argonaut’s explosive permit at its La Colorada mine to May 16, 2018 (see press releases dated April 12, 2018 and April 17, 2018). After a thorough review of previously blasted ore in the pits, ore stockpiles and the ability to mine certain areas without requiring blasting, the Company estimates it has sufficient ore to continue operations until the end of July at its budgeted crushing throughput level of 12,000 tonnes per day. VANCOUVER, British Columbia – (April 26, 2018) Oroco Resource Corp. (TSX-V: OCO) (“Oroco” or “the Company”) is pleased to announce that it has closed the non-brokered private placement financing (the “Financing”) previously announced by news releases dated April 11, 2018 and April 16, 2018. The Company has raised gross proceeds of $900,000 through the sale of a total of 9,000,000 units at a price of $0.10 per unit. Each unit consists of one common share and one-half of one common share purchase warrant. Each whole share purchase warrant will be exercisable into one additional common share for a period of 18 months from closing at a price of $0.16 per share. The exercise period for the warrants may be accelerated to 30 days if, at any time after the first 4 months of the warrant exercise period, the volume-weighted trading average of the Company’s shares over a period of 20 consecutive trading days exceeds $0.35.